When you realize that someone is referring to one of your favorite novels, a book that has been an intellectual treasure and a literary inspiration, pleased may not be a powerful enough word. Thrilled may also be an understatement. While I was sitting in the audience listening professionally, I found that suddenly I was really listening. Politics is process, but literature is life. “For everything to stay the same, everything must change.” It’s a lesson I have followed several times in my life, and it’s a thought that Culver City needs to listen to closely. 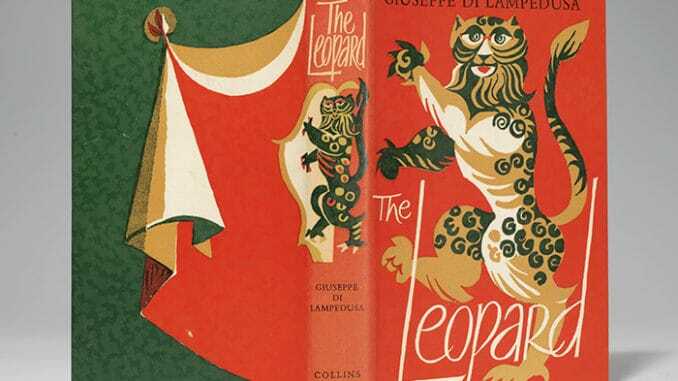 I first read “The Leopard” by Guiseppe Thomasi di Lampedusa in 1983, after finding it in a closet, covered with dust. It is still a novel I love without any reservation, a technically perfect piece of literature. I recommend it to people often, particularly when they are concerned about politics and human nature. And the importance of dust. Although the book opens with a priest consulting the stars, it comes into focus on the prince, who is growing concerned about the speedy approach of Garabaldi’s revolutionary army, and the slow but steady rise of the merchant class. He is concerned, yet also in denial, about the threat to his existence, but far more worried about the threat to his inheritance – what will happen now? What will happen next? The social and political structure of Italy was held in place by the system of aristocracy, and the system of aristocracy was held in place by rigid traditions. Change was not ever in the plans. Lampedusa himself was a prince, the last of line that ruled from Palermo on the island of Sicily. When the family’s historic palace was destroyed by Allied bombs in WWII, (although political power had long since moved away) he fell into a depression, and wrote the novel as a way to both honor his ancestors and make peace with the world. The leopard on their coat-of-arms was seen as both noble and an animal, qualities that Sicilians, and other human beings, carry with consequence. While some other parts of the country seem to be working in a fantastically backward direction, trying to return to some previous (mythical) moment when all was well, we find ourselves in a political moment where our traditions benefit by changing and social structures are being refreshed by being reformed. Mayor Small’s enthusiasm for making sure that the middle class of Culver City not be displaced in the rising tide of tech wealth, and his endorsement of getting educated about our dangerously violent and racist past, speak to the fact that if the golden age is anywhere, it must be ahead of us. If we plan for it, and travel wisely, we could arrive. The plot of The Leopard turns completely on one bit of information given to us at the very end, and reading closely, listening carefully, reveals a wildly different story from the one you thought was concluding. The final image is of a woman throwing away a relic from the past, only to see the far-flung dust form an image of a leopard in the air as it falls away. The past will remain what it was. The future will be what we make it.